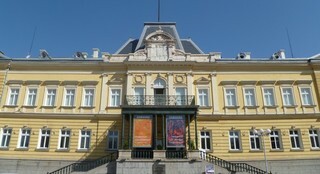 The National Museum of Bulgarian Art is the largest and most respectable institution of its kind in Bulgaria. Over the years, it has established its position as a center for national cultural heritage and values. The collection was started in 1892 when the People’s Museum of Archeology founded its Department of Art. The museum’s collection of New and Contemporary Bulgarian art from the period since Bulgaria’s Liberation in 1878 up to the 1990s consists of more than 30 000 individual pieces of paintings, prints and sculptures. The collection of paintings by Bulgarian masters is the most comprehensive. The collection of black and white drawings is also very rich. The museum’s expositions feature some of the best achievements of Bulgarian sculptors of the 20th century.